Keeping nutrition as a priority can be tough for busy families. Resources from Journeyworks provide guidance on how to prepare healthy meals and snacks while saving time and money. Keeping a colorful magnet on the fridge or snack cabinet is a helpful reminder to skip the chips and go for a healthy fresh produce alternative. Studies are increasingly linking late-life health concerns, such as heart disease and diabetes, with the eating habits developed in a person's younger years. Unfortunately, childhood obesity continues to increase at an alarming rate. The cost of high-quality ingredients, and the lack of time for wholesome cooking, are often-cited obstacles to eating right. 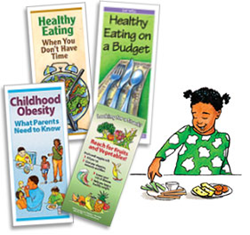 Journeyworks Publishing announces new materials to help health educators teach families to model healthy eating habits for their children. With a focus on good family nutrition, these new materials are ideal send-home pieces full of actionable tips for making nutritious quick meals within a limited budget. Journeyworks Publishing, a leading provider of health and wellness education materials, understands the foundation for a lifetime of good eating habits starts at home. Health educators and other professionals are invited to receive review copies of their new and best-selling print materials focused on family nutrition. Planning ahead, cooking in large batches and keeping healthy snacks within eyesight are just a few of the many tips provided in the Journeyworks Family Nutrition sample pack. The complimentary samples include a magnet emphasizing grabbing a smart snack, instead of junk food. A recent study shows the US diet is improving slightly, but we are still falling short in the amount of fruits and vegetables consumed. Keeping a colorful magnet on the fridge or snack cabinet is a helpful reminder to skip the chips and go for a healthy fresh produce alternative. Professionals promoting nutrition can click here to request a complimentary Family Nutrition review pack today.